Restaurants are starting to trickle into place at Beech View Place on Beechurst. 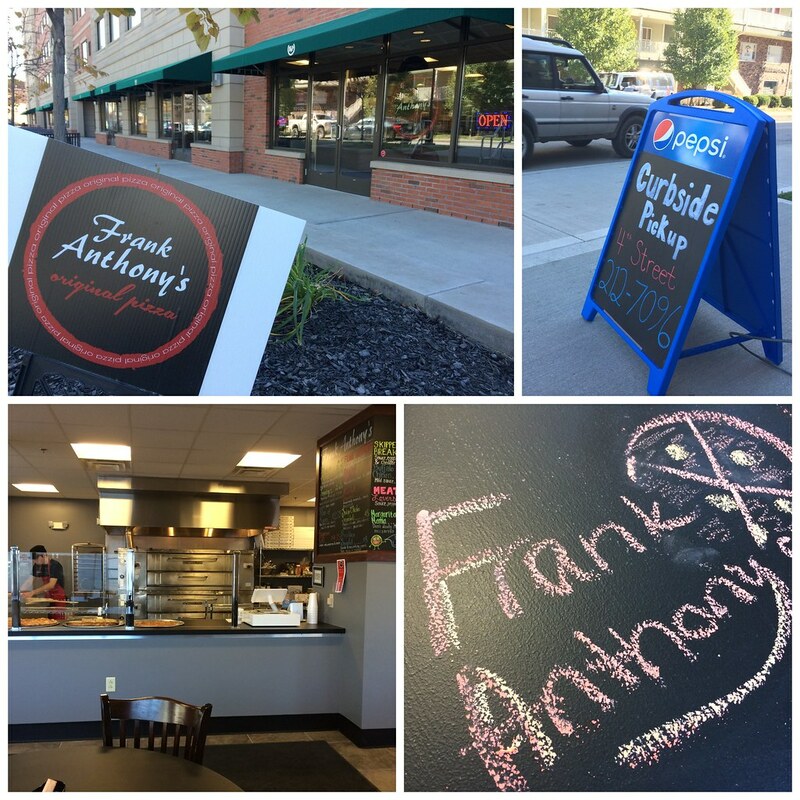 First, The Greeks opened, and within the past couple days, Frank Anthony's Original Pizza has opened. Parking: You can enter the garage beneath the building from the Fourth Street entrance. When you visit the restaurant, they will give you a token you use as payment. Simple. The inside is a good size, with a counter space showcasing a handful of pizzas you can purchase by the slice. Only cheese/pepperoni pizzas were out when we were there, but they said they'd make anything. And as we were leaving, there were a few specialty ones available by the slice. You can order small, medium and large regular pizzas with a number of toppings. 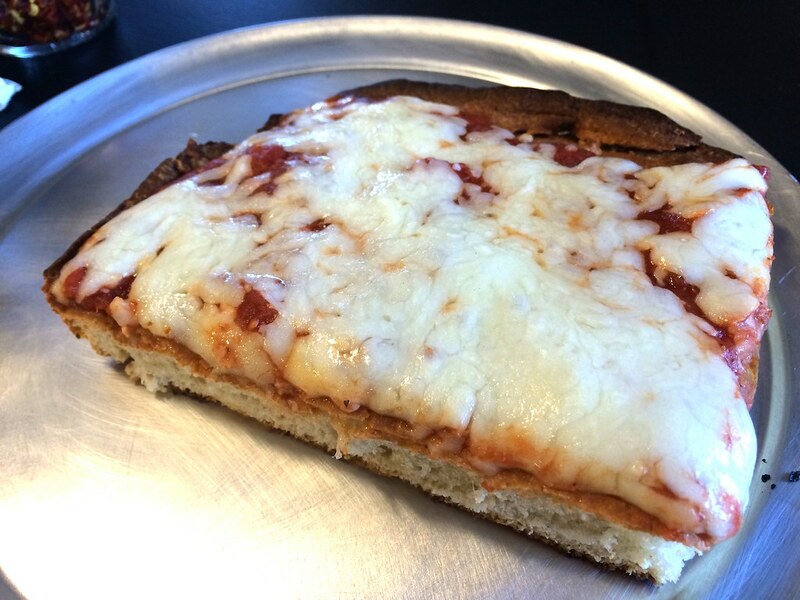 Or special pizzas, including a breakfast pizza, a buffalo chicken pizza, a meat lovers and a margarita pizza. 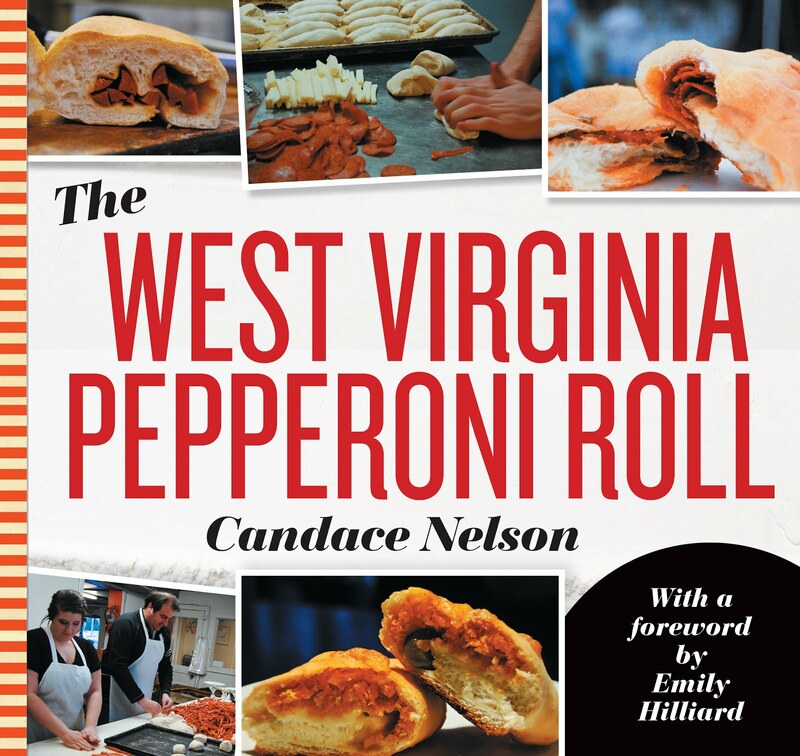 Plus pepperoni rolls, strombolis and garlic knots. Tony, Jake and I kind of decided to do one of everything. We each had a single slice from the pizzas. I had a slice of cheese, while the boys got pieces of their Sicilian. We also ordered a meatball stromboli. Plus drinks. For a grand total of around $24, so $8 each. That's not bad at all. Through chatting with the man working, we learned the owner is from Ohio and decided to open up this pizza place because he was friends with the folks who own the building. 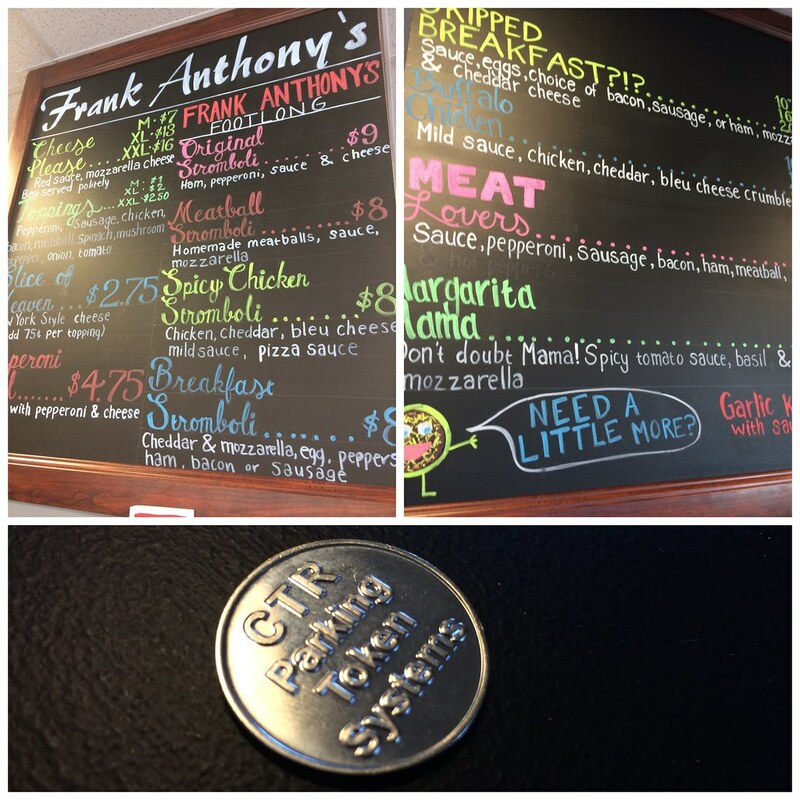 It's the only Frank Anthony's location and is named after the owner's two sons: Frank and Anthony. 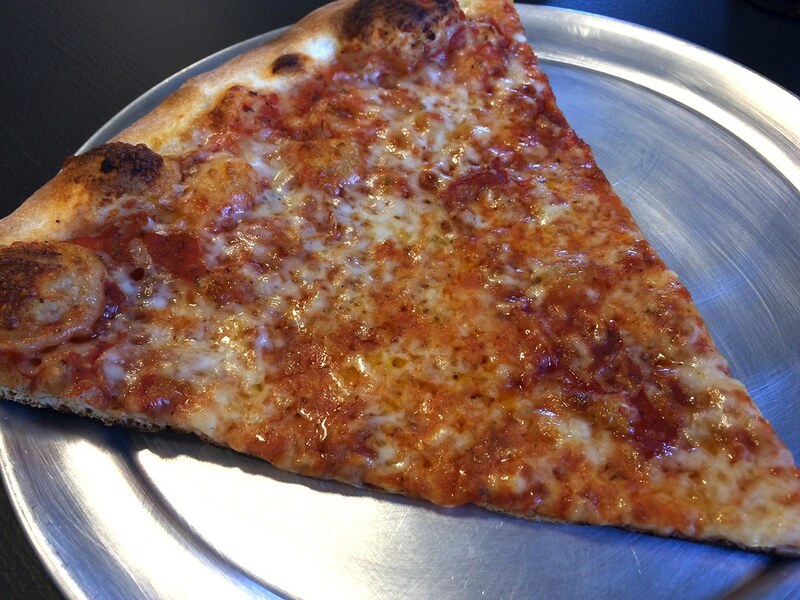 First, our slices were delivered. 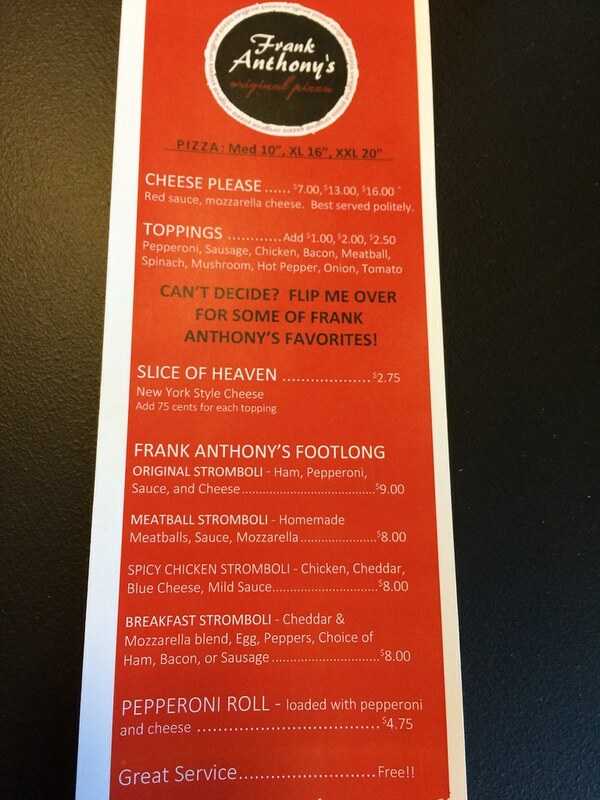 I had already decided Tony was giving me half of his Sicilian, and I'd give him half of my cheese in return. The regular cheese: very flat, really tasty sauce (hint of spice that I love) and lots of melted cheese. The only thing was that the pizza should have been taken out like a minute earlier - a little too dark on the bottom for my liking. But, flavors on point. The Sicilian was also good - same great flavors. Just lots more breading if you dig that. Also, a little too dark - but that's new restaurant stuff they'll work out. The point is that the main components here are all tasty - dough, sauce and cheese. 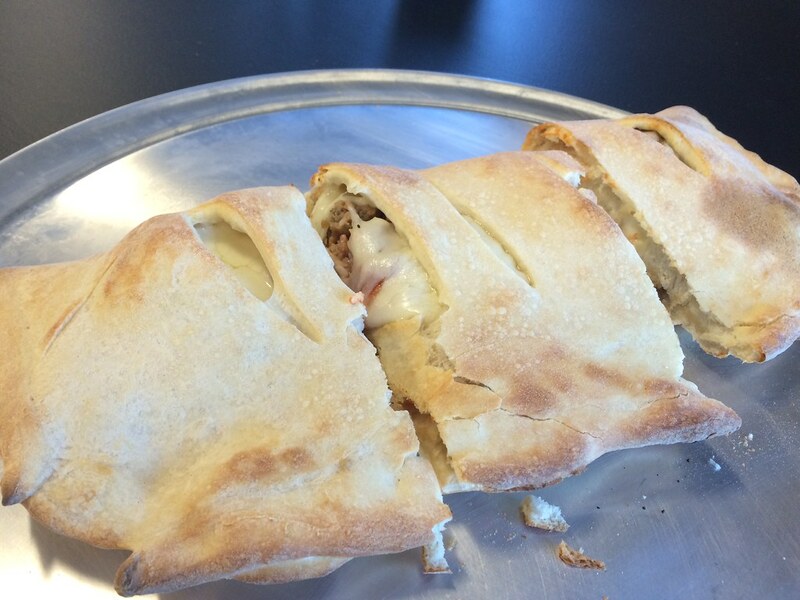 The stromboli, though, was super, super good. It's the only thing we had made-to-order, so we waited a little longer on it -- but not long, at all, really, just had finished our slices. It was cooked to perfection. Nice brown around the edges and bottom. Flaky, crisp dough. You could tell they were being careful and checking it and adjusting to make sure they're getting the right color. Flavorful meatballs, perfect ratio of sauce and lots of stringy cheese. So good. And they're like a foot long for $8. Pretty good deal in my world. The gentleman working was very kind, knowledgeable and wanted to make sure we enjoyed our food. The flavors are great. Little things like taking the pizza out just a hair earlier is easy to fix. And they're doing cubside pickup along Fourth Street. Very cool. PLUS you get to draw on the tabls with chalk. 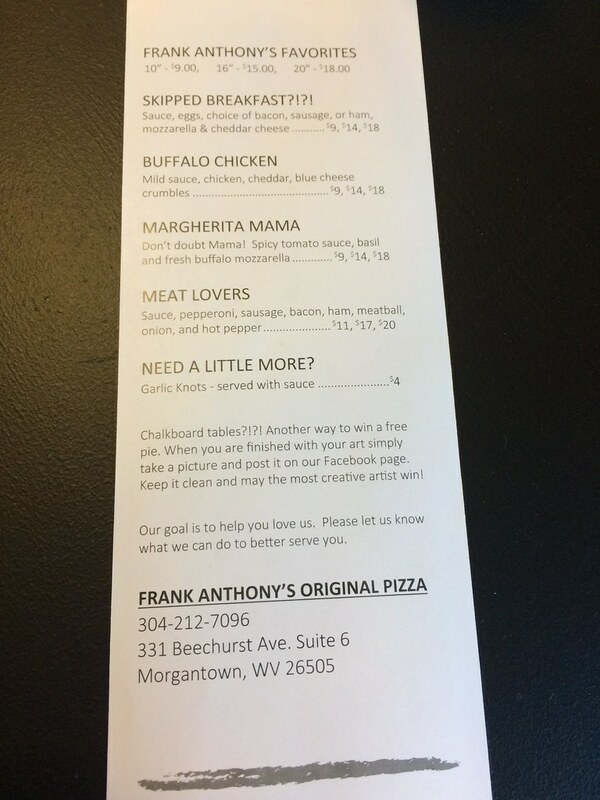 If you post your piece of art to their Facebook, you could win a pizza. Hoping this one sticks around.